Wines from Australia, which mostly come from the wineries and vineyards in the famous Barossa Valley in Australia's Southern region, are considered among some of the best in the world. Wineries and vineyards in Barossa produce a variety of wines including the popular red and White Wine varieties although the region is noted for its red wine, particularly Shiraz. Australia exports its wines to major wine consumers like the USA and to wine loving countries from Europe like the United Kingdom. India shouldn’t even ring a remote bell in the wineries of Australia. The value of our wine imports from Down Under had barely touched A$1 million between September 2003 and August 2004; the United States, during the same time, had purchased wine worth A$900 million, and Britain followed with A$870 million. Aussie imports are expected to contribute a little less than a quarter of the 72,000 cases of wine being shipped into India this financial year, but our national wine consumption isn’t likely to create a ripple even at McWilliam’s. Australia’s largest family-owned company, after all, produces 30 million bottles a year. Yet, its International Trading Manager, John Rogers, who spends 24 weeks in a year living out of suitcases, has been to India twice in three years. John, a gag-bag who has a delectably funny story for every occasion, loves visiting India. On his latest visit, his wife even dug out the school records of her father who was born and raised in Ooty. But the reason why he’s bullish about business possibilities in India has nothing to do with his urge to travel, or with nostalgia. “I see India as a very, very significant emerging market,” he said, clearing his palate with Foster’s (don’t blame him, he didn’t have any other choice!) at the Orient Express. “India and China are the future of the wine business. Younger people in these two countries will be driving the wine business forward. They see wine as being trendy.” John draws comfort from the fact that the average value of the Aussie wine drunk is India (A$6.27) – “Indians aren’t having rocket fuel,” he says, referring to supermarket brands. It signifies that the market has traded up, at a time when supermarket brands rule many markets, notably Britain. Another reason for John’s confidence is what he sees as a perfect match between Indian food and Australian wines. “We all know that spicy food goes best with spicy wine,” he says. “And what’s the world’s greatest spicy wine? Australian shiraz, of course.” John didn’t have to work too hard to prove his point, because the six McWilliam’s wines he presented to members of the Delhi Wine Club at a dinner at Fire, the city’s trendiest pan-Indian restaurant with the most innovative menu, hit it off beautifully with the food prepared by Chef Bakshish Dean’s team. The happiest pairing was that of the Kareli Gosht Kebab with the Brands of Connawarra Cabernet Sauvignon 2001 from Australia’s most famous wine-making region, half-way between Melbourne and Adelaide, famous for its red soil sitting on a bed of limestone. The discovery of the evening, though, was the Brands of Coonawarra Chardonnay 2003, which Rogers cheekily described as a “Dolly Parton Chardonnay” because of its “huge upfront style.” This is one analogy that I won’t forget in a hurry. The marriage that would’ve walking away with the top prize at the Wills Made For Each Other contest, had it still been around, was that between Parsi Chicken with Apricots and the Mount Pleasant Old Paddock and Old Hill Shiraz 1998, from the picturesque Hunter Valley. You wouldn’t imagine a wine with a dominant personality to flow so smoothly down your palate and combine perfectly with a chicken dish with a sweetish after-taste. Maybe it was the hint of prunes in the wine that was responsible for the ease with which it accepted the chicken with apricots. The next time you’re at a loss about which wine to order with a gentle curry, just ask for this incredible Shiraz. 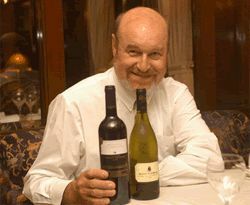 To find out more about McWilliams wines, log on to www.mcwilliams.com.au. For information on Australian wines, check out the Winemakers Federation of Australia website, http://www.wfa.com.au.